February 13, 2013 was Kenneth Ma’s (馬國明) 39th birthday. 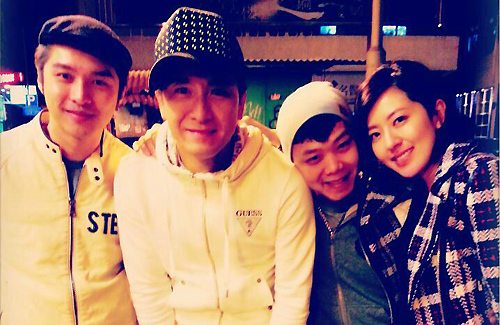 One day before, he was spotted celebrating in Dai Hung with his good friends, which included Jazz Lam (林子善), Natalie Tong (唐詩詠), and Stephen Wong (黃嘉樂). Kenneth remainedsingle ever since breaking up with his former girlfriend, Nancy Wu (胡定欣), back in 2011. Although there were many women present at the celebration, Kenneth did not make any moves. The group enjoyed hot pot and ordered pizza. It seemed like Kenneth liked the food more than socializing with women. In fact, he did not join in many conversations. He was spotted picking up a slice of pizza with one hand and taking large bites of it, unaware of his deportment. Kenneth’s friends had introduced women to him in the past, but he had insisted upon purchasing a new house and further cementing his career status before engaging in a new relationship. Jazz, who was standing right beside Kenneth, added, “We’re celebrating his birthday, so there’s hot pot and pizza.” With that, Jazz and the birthday star leaned in and playfully pretended to kiss each other. Instead of planning further celebrations, Kenneth expressed that he wishes to go home to watch a ball game afterwards. He looks like he is crying in that picture above. It’s no less news worthy than Raymond Lam’s relationship with what’s-her-face, and there are enough articles about him to last a lifetime. “He was spotted picking up a slice of pizza with one hand and taking large bites of it, unaware of his deportment” LOL!!!! !